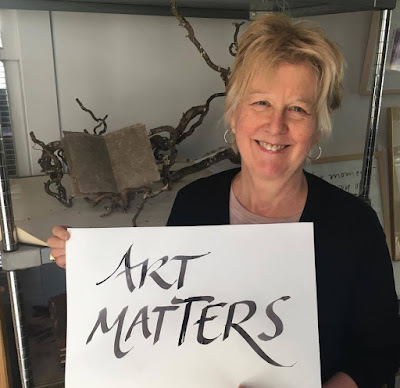 Saturday, June 17, 12-1 P.M.
Newburyport artist Susan Kapuscinski Gaylord will share her experiences as an artist: how she came to be a person to whom art deeply matters, how art is her therapy and her religion, how she creates her signature series, the Spirit Books, and the motivation and process of her latest calligraphic series, Words For Our Time. To conclude the talk, Susan will “letter live” and create a calligraphy piece. Susan is one of the featured artists in PEG’s current exhibition, Pretty As A Picture: Tusinski, Roy & Gaylord. MA. She is inspired by the spirit of nature, both wild and cultivated, and the beauty and power of words. The exhibition includes her Spirit Books, wordless volumes of textured papers with twigs, beads, golden stitched spirals, and pinpricked designs that rest in cradles of branches and roots and honor the spirit of nature, and Words For Our Time, calligraphic quilts based on eight words: strength, hope, truth, peace, justice, love, courage, and compassion.